Last May, as some of you lovely blog readers may remember, I walked some of The Ridgeway in Wiltshire. I planned to do a series of paintings, and did lots of drawing along the way, and took loads of photos. 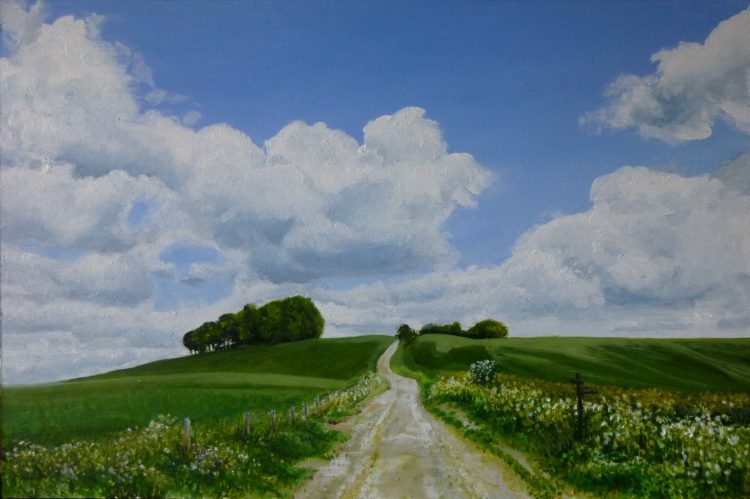 But The Ridgeway I, which I sold at my Open Studios in September, was the only one I got done last year. This was a particularly lovely part of the walk, quite close to White Horse Hill, heading north east towards Barbury Castle. I remember the weather was perfect, with bright sunshine, and huge dramatic white cumulus clouds. The chalk ridge is really high at this point and as I walked I could see for miles off towards the west. I am planning to get the rest of the series gradually done, in between my 2017 project ‘A Year on Fingringhoe Wick’.